← How Do You Find Your Perfect Eyebrow? Iron Fist, a Los Angeles based-footwear, apparel, and accessory lifestyle brand, has teamed up with Soles4Souls for a one of a kind Shoe Art Exhibit and Charity Auction. 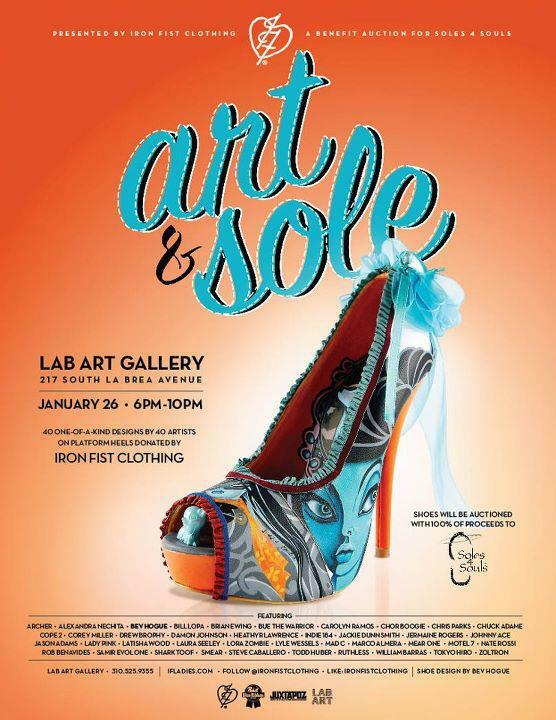 Iron Fist will be showing a number of the pairs of shoes at street art gallery Lab Art in Los Angeles on January 26th, 2012 through January 29, 2012. Lab Art is located at 217 S. La Brea Avenue, Los Angeles, California. Art & Sole features one of a kind custom artwork on 40 pairs of high heel shoes by 40 artists from around the world. The shoes will be displayed at various art galleries and trade shows from January through July 2012, culminating in a Charity Auction benefiting Soles4Souls to be held in July on CharityBuzz.net. Featured artists include: Chris Parks, Bev Hogue, Shark Toof, Marco Almera, Drew Brophy, Johnny Ace, Laticia Wood, Laura Seeley, Lady Pink, Mad C, William Barras, Motel 7, Chor Boogie, Alexandra Nechita, Cope2, Indie 184, Steve Caballero, Damon Johnson, Jason Adams, Chuck Adame, Tokyo Hiro, Lora Zombie, Mear One, Brian Ewing, Corey Miller, Archer, SMEAR, Jermaine Rogers, Lyle Wessels, Jason Schroder, Todd Huber, Heathyr Lawrence, Ruth Pineda, and Carolyn Ramos. This entry was posted in Art, Events, Fashion and tagged #art&sole. Bookmark the permalink.